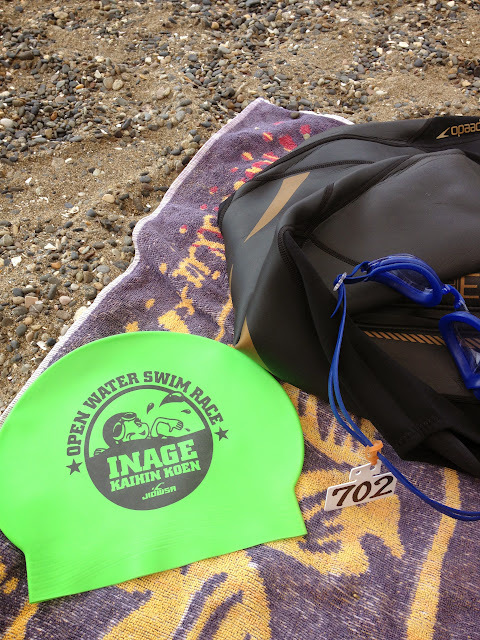 Without any swim training, I went along to yesterday’s OWS race at Inage, Chiba. A beach it is not. The Inage seaside park OWS race is in fact in Tokyo Bay. At least the race venue was close to get to. Can’t say much about the scenery though. I had signed up for this race at least a month ago, and with the burn injury in early June, I haven’t been able to do any swim training. It was painful to wash in the shower, let along jump in the pool. In spite of lack of training I went in the race – my first swim since the burn. I wore a wetsuit, mostly because I was dubious about the water quality of Tokyo Bay. Water temps were pretty warm though. Actually, this race was probably had the highest number of people competing without wetsuits that I’ve seen so far in the last 3 years. The Inage swim venue is surrounded by industrial factories and airplanes overhead from both Narita and Haneda airports. The conditions got too choppy and the wind really picked up, so they had to shorten the race distances – the 1.5km would only be a 1km race, and the 3km race would only be a 2km race. I was a little relieved. I had signed up for the 3km! Was grateful that I would only be doing 2km especially without any swim training. The “beach” had more pebbles than sand. One of those rocky beaches. I ended up swimming not too badly, all things considered. I swam the 2km course in a time of 35minutes and 7 seconds, which was decent for me. I got second place in my age group, which was enough to score me a medal. I got 6th place female overall. Granted, there were only 10 of us. The girl who was first female, I later found out is currently training for the Olympic Games — pretty impressive. But I actually did pretty well, out of all the competitors – of which there were about 60. A couple of friends even came along to the race to watch and we had a bit of chill out day at the beach. I think the highlight of the day, was not the medals, but rather the mullets. Yes, plural! The only thing better than a mullet on a Japanese kid (or any person for that matter), are twins with matching mullets!!! Pure gold. Twice the mullet, twice the fun. You know what they say about mullets – business at the front, party at the back! Just too goddamn adorable. Twins and mullets. Just kill me with cuteness now. Seriously, what did these kids do to deserve such a hairstyle? Do their parents take joy in child cruelty?